Mustafa Ali not expected to remain in the Elimination Chamber match, Double or Nothing pre-sale, report on Dave Bautista, Jay White wins the IWGP title, MLW moving to Saturday nights & more. **Rewind-A-Raw returns tonight with Wai Ting and I reviewing Raw and a complete rundown of the New Beginning in Osaka event. Plus, we will chat a busy day of news with the latest on Mustafa Ali, Double or Nothing pre-sale, Kota Ibushi’s return on today’s show Osaka card, Jay White’s title win, the newest class at the WWE’s Performance Center, MLW switching nights on beIN Sports and we will take your feedback and questions. This show may end up being four hours. 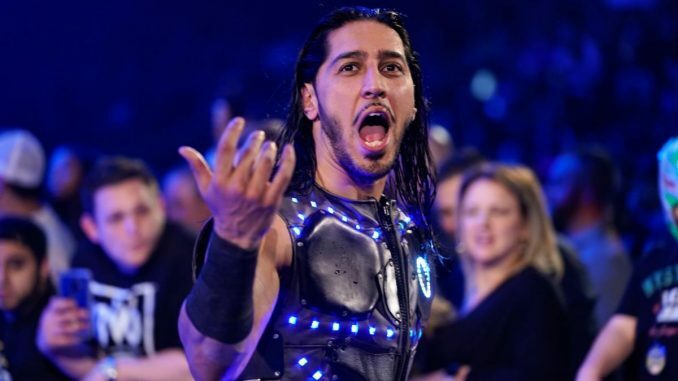 **Fightful’s Sean Ross Sapp broke the news Monday that Mustafa Ali has been pulled from this Sunday’s Elimination Chamber match due to injury. We were able to confirm this report and told that after Sunday’s live event, Ali was evaluated and pulled from the tour. We were also informed that they have not decided on a replacement yet for the match on Sunday. Fightful added in their report that Ali assured WWE officials he could work but the promotion is opting to be cautious. **Jay White won the IWGP heavyweight title this morning from Hiroshi Tanahashi in the main event at New Beginning in Osaka. After the match, White indicated he wouldn’t be defending the title until the G1 Supercard at Madison Square Garden, which is typical for the champion not to defend the title at the Anniversary card. The reaction has been mixed, which is what I expected from some believing White isn’t ready for the top position. I loved the match today, I’m very high on Jay White and I felt the promotion needed to make a bold move for their future and making it clear that they are all in on White as the top heel in the company. When White returned from his excursion, I felt the Switchblade character was a rough transition for him and led to a flat match with Tanahashi at Wrestle Kingdom last year. The struggle was evident, although everyone saw upside in White as he always had the tools. For me, it clicked at the Cow Palace card in San Francisco against Juice Robinson and gave White the necessary momentum going into the G1 where he was booked strong to go over Tanahashi and Kazuchika Okada. Since the G1, the confidence White has is evident and he’s become the character as opposed to mimicking one. The favorites for the New Japan Cup would have to be Okada and Kota Ibushi to set up the IWGP heavyweight title match at Madison Square Garden. If White is only holding the title until the Garden event, I think it could be negative if he’s only designed to be a transitional champion. After two wins against Okada since the G1, it would be hard to imagine Okada losing a third time to White. I’m glad they went with this option. New Japan’s business is directly tied to stars selling tickets and part of the equation in star creation is being several steps ahead of the public when it comes to recognition of who those stars are. Gedo has a stellar track record in picking out those stars, the biggest one being Kazuchika Okada, who faced tremendous skepticism when he won his first title in 2012 from Tanahashi. I felt White showcased lots of poise and confidence in the role and ultimately, the next few months will bear out the results of today’s decision. **Kota Ibushi made his first appearance at a New Japan card since Wrestle Kingdom in January. Ibushi announced he was staying with New Japan and would return in the New Japan Cup tournament next month. The tournament begins on March 8th and the winner will receive a title match of their choosing, which will likely take place at the G1 Supercard at Madison Square Garden in April. Ibushi received a phenomenal reaction when he announced the news on today’s card and is a big win for New Japan that they were able to secure him. **Following today’s title loss, it marks the second time in his career that Hiroshi Tanahashi has lost the IWGP heavyweight on February 11th. Tanahashi lost the title to AJ Styles on this date in 2015 and it’s the third time Tanahashi has lost the title at a New Beginning event with the other to Kazuchika Okada in February 2012. At 38 days, it is the shortest IWGP title reign since Kensuke Sasaki held the title for 16 days in March 2004. **It was made official on this week’s episode of Being the Elite that the rematch will between Kenny Omega and Chris Jericho is official for Double or Nothing on May 25th in Las Vegas. On the same episode, they revealed the seating chart for the event. **Tonight’s episode of Raw takes place from Grand Rapids, Michigan as they head into the Elimination Chamber event this Sunday. Becky Lynch and Seth Rollins are both scheduled to appear on the show. There was a challenge set up on last week’s show by Dana Brooke to Natalya for tonight, as well. **The SmackDown crew has a house show in Canton, Ohio tonight with AJ Styles vs. Randy Orton advertised along with Asuka vs. Charlotte Flair and a fatal four-way match with R-Truth vs. Rusev vs. Shinsuke Nakamura vs. Samoa Joe for the United States title. The SmackDown and 205 Live tapings will be in Toledo on Tuesday night featuring a Gauntlet match involving the six participants in the men’s Elimination Chamber match and the winner becoming the final entrant in Sunday’s match. **MLW has announced that their weekly television series, Fusion is moving to Saturday nights at 9 pm Eastern on beIN Sports. The switch will go into effect beginning this weekend with the series also running Monday nights on beIN Sports Espanol. The series debuted last April on Friday nights and recently had expanded to include live monthly specials on Saturday nights. Their next live special is scheduled for Saturday, March 2nd from Cicero Stadium. MLW has wanted to make the move for a long time and we were told that the viewership of last Saturday’s special from Philadelphia accelerated the move. They have not decided on a rollout strategy yet for the YouTube release, which had previously been going up Saturdays at 6:05 pm for those without access to beIN Sports. **Stephanie McMahon was a guest on Facebook’s 3.5 Degrees podcast to discuss being part of a family-run business and working for her father. **The newest class at the WWE Performance Center was revealed on Monday with most names known ahead of time. A tweet was posted by the WWE to announce that Trevor Lee, Rachael Ellering, Karen Q, Sam Shaw, Jonah Rock, ACH, Scott Parker & Shane Matthews (the tag team 3.0), Nick Comoroto, Omari Palmer, and Ricardo Miller are part of the latest class. **Chris Jericho announced details for the second Rock ‘N Wrestling Rager on Monday. The second cruise will take place from January 20th to 24th in 2020 and sail from Miami to the Bahamas. Jericho announced that All Elite Wrestling will be part of the cruise for the wrestling portion. **The WWE stock closed at $86.82 on Monday. **Bet Online has released odds for the Elimination Chamber this Sunday. In the men’s Elimination Chamber match, the favorite to win is Daniel Bryan followed by AJ Styles. In the women’s Chamber match, the favorites are Bayley and Sasha Banks followed by Nia Jax and Tamina. Buddy Murphy is a -700 favorite to retain the Cruiserweight title over Akira Tozawa, Ronda Rousey is listed at -5000 to retain over Ruby Riott and Shane McMahon & The Miz are -500 favorites against The Usos. **Black Label Pro has announced that Jonathan Gresham will face Masato Yoshino at their WrestleMania week card on Friday, April 5th at the White Eagle Hall in Jersey City. The show already features Ethan Page defending the Black Label Pro championship against Kobe Durst, an Open Challenge by Bryan Alvarez for the ICW/ICWA Texarkana championship, and Nick Gage vs. Swoggle. The card is scheduled for a 3:30 pm start. **MLW has announced a tag match with Pentagon Jr. and Fenix vs. Laredo Kid and Taurus of AAA on March 2nd at Intimidation Games at Cicero Stadium in Chicago. On this past Friday’s episode of MLW Fusion, Pentagon and Fenix announced they were not leaving MLW and would be part of this card. Pentagon is still scheduled to face LA Park on April 4th when MLW returns to the Melrose Ballroom during WrestleMania week. **FITE TV has announced an agreement with the UK-based Fight Forever promotion, which just ran their first tour in December. The group will be taping two events on March 29th in Birmingham, England at PRYZM Birmingham featuring PAC, Joe Hendry, David Starr, Candy Floss, El Phantasmo and others. The first show, “Dance of the Dragon” will air for free on Monday, April 8th on the streaming service. The second event, Fight Syndrome will be available on Fite on Monday, April 15th. **Dory Funk Jr. won the NWA heavyweight title on this date in 1969 in Tampa, Florida. Funk defeated Gene Kiniski, who had held the title for over three years. Funk would surpass Kiniski’s length and hold the NWA championship until 1973 when he dropped it to Harley Race.